Benadryl for Dogs: When Can You Use it and Why? Home/Dog Health/Benadryl for Dogs: When Can You Use it and Why? Does your dog have a problem with food, skin or flea allergies? Is he itching, biting or clawing at his skin all of the time? Maybe your dog has a problem with constant anxiety or restlessness? If your answer was yes to any of the questions above, Benadryl for dogs could be an absolutely fantastic solution to your problems! That being said, there are many things a responsible pet owner who truly cares about the well being and comfort of their dog should know about Benadryl before simply offering is on a whim. Be the loving, caring and educated pet owner we know you are; find out below exactly what you are giving your pet, when to give it, and how it works! *The above links lead to current prices and customer reviews on Amazon. 3. How Does Benadryl Work on Dogs? 4. How Does Benadryl Affect Dogs, and What is it Used for? 5. What Are the Side Effect of Benadryl? 8. How Long Does Benadryl Last? Benadryl for dogs is a popular over-the-counter medication, but the main active ingredient is called Diphenhydramine. Diphenhydramine is an antihistamine, often used to help relieve symptoms of allergies, hay fever, and the common cold by blocking histamines the body creates during allergic reactions. It also helps treat nausea, vomiting and dizziness, as well as help relaxation. Sometimes, manufacturers will combine other drugs with Diphenhydramine in their Benadryl tablets; not all Benadryl is the exact same. It’s important to make sure there is only Diphenhydramine in the tablets when medicating! In general, the medication was designed for use with humans (but can be given to dogs), helping treat the list of symptoms below. Diphenhydramine is considered a first-generation ethanolamine-derivative antihistamine, meaning it can cross the ‘blood-brain barrier’ where others can’t. This ability helps make Diphenhydramine pretty effective, but can also increase the risk of side effects over other medications that can’t cross the ‘blood-brain barrier’. How Does Benadryl Work on Dogs? The body still receives these histamines that are released during an allergic reaction, but the receptors are blocked from registering them. It can be compared to attempting to leave a phone message on a mailbox that is full; the cell phone answering machine still works, but the carrier automatically won’t accept it! How Does Benadryl Affect Dogs, and What is it Used for? Though Benadryl can be used with dogs, it might work to treat slightly different symptoms because dogs tend to react to allergies differently than humans. Usually (not always) dogs show reactions through their skin via itching, redness, swelling, etc. Humans, on the other hand, might have these symptoms in addition to dangerous swelling of the face and throat. Dogs suffering from seasonal allergies, food allergies, and mild allergic reactions to bites (such as flea bites) usually respond well to Benadryl. It’s most commonly used to treat skin allergies. One of the side effects of Benadryl is drowsiness, which helps with anxious dogs. For example owners might give their dogs Benadryl to help with travel or car anxiety, which is pretty common. It can even help relieve motion sickness in dogs with that problem. Though dogs suffering from allergic reactions usually don’t swell in the neck or face, especially not to the extreme that it blocks their airway, this does happen. Benadryl isn’t going to help much if your dog’s throat is beginning to close, even if he is able to swallow it. If this happens, it’s vitally important to get to a veterinarian as soon as possible so they can administer an intravenous injection in order to relieve the swelling! What Are the Side Effects of Benadryl for Dogs? Like most drugs, Benadryl for dogs isn’t 100% safe 100% of the time; although rare, there are side effects. Just like people check with their doctors before starting a new medication, you should always check with your veterinarian to make sure there are no possible complications with other drugs your dog might be taking, or to make sure it won’t worsen a pre-existing condition. If your dog has any of the following conditions, make sure you talk with your veterinarian before using Benadryl for dogs! If you’re wondering whether or not your dog can overdose, the answer is certainly yes. Overdoses can be very dangerous to life threatening, which is one reason why it is so very important to contact your veterinarian before giving it out to your dog! Since Benadryl for dogs is supposed to give a calming effect, the agitation/increased anxiety will often be a clear indication there is a problem. It’s also possible that some dogs (although rare) may be allergic to the medication. Thankfully, you now have a better idea of how an allergy works and how the body reacts to it! Since Benadryl for dogs is used to treat allergies, this is certainly not a god thing; you should again consult your vet as soon as possible! Like young human children, a puppy’s immune system is weaker than an adult dogs. Now you know that you can give an adult dog Benadryl, but can you give it to a puppy also? The answer to that question is yes – you can give Benadryl to puppies in some cases, but puppies younger than 4 months might have trouble handling the powerful antihistamine (again, it’s important to contact your veterinarian first). That being said, due to their size, it is very easy to overdose, and an overdose can be worse for a 5 pound puppy than a fully grown adult. The recommended dosage is 1 mg per pound of body weight. Chewable adult tablets normally come in doses of 25 mgs or sometimes (but less often) 12.5 mgs. If you’ve just given a 10, or even 15 pound puppy a full 25 mg. capsule/tablet, you’ve overdosed your dog. If you’ve given a 5 pound puppy a full dose, and continue to offer the same dose as recommended for an adult dog or human, you might have just made the problem much worse. Even if you chop the tablet in half, how can you be sure what the new dosage is? You can’t be sure. In the end, it is safer to avoid administering Benadryl to very young puppies, which is probably what your veterinarian will tell you. How Long Does Benadryl Last? In dogs, Benadryl usually lasts 8-12 hours. The keyword is usually! This will depend on things like the amount given, size of the dog, how much food you gave along with the Benadryl, energy levels/ age of the dog, etc. Are you looking for a form of Benadryl specially made for dogs, so you don’t accidentally overdose or hit any other complications? 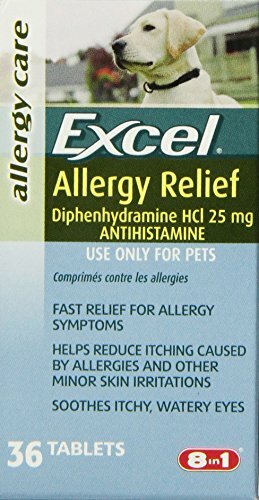 Specially made for dogs, Excel Allergy Relief is fantastic for pets with allergies! 1. Can you give a dog Benadryl? Yes! Dogs can take Benadryl, for much the same purposes as humans. On the other hand, the dosage is different for dogs, or even a dog the same size. Even if you think you know how much to give, it’s important to ask your veterinarian what the exact dosage for your dog should be. Certain medical conditions contraindicate the use of Benadryl, like high blood pressure or cardiovascular disease. For a long time, and even to this day, countless pets suffer from allergies that could easily be treated with something as simple as Benadryl. 2. How much Benadryl can I give my dog? Before anything else, this is a question for your veterinarian, just in case there is a complication with your particular pet or breed. That being said, the usual dose for dogs is 1 mg per pound of body weight, given 2-3 times a day. 3. How often can I give my dog Benadryl? Again, the normal dose for Benadryl given to a dog is 1 mg. Per pound of body weight, given 2-3 times daily. Just like most things, too much isn’t good; re-administering Benadryl over and over if you don’t see an improvement right away is certainly a bad thing. If you aren’t sure how much to give or if you’ve given too much to your dog, your veterinarian is only a phone call away! That being said, sometimes all it takes is one dose. 4. How much Benadryl for a 10 pound dog? For 15 pound dog? The standard dosage for dogs is 1 mg. Per pound of body weight, given 2-3 times daily as needed. For a 10 pound dog, that would be 10 mgs. and 15 mgs. For a 15 pound dog. That being said, it is always important to consult your veterinarian before offering any drug to your pet, if only to make sure there would be no complications! 5. Is it safe to give Benadryl for dogs? In most cases, yes. Although sometimes other drugs besides Diphenhydramine (which is what you are focusing on) are contained within store bought Benadryl tablets. You want to make sure this isn’t the case for your dog! 6. How much Children’s Benadryl can I give my dog? You might have a problem getting your dog to drink the liquid form of Children’s Benadryl, as they probably won’t like the taste. That being said, this completely depends on the dosage for both liquid and solid forms. 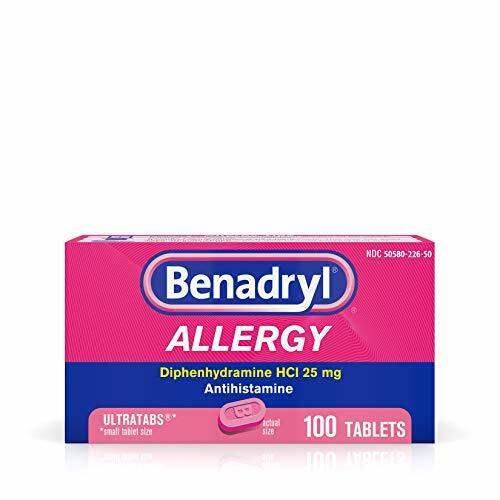 On the Benadryl homepage, the children’s version of the drug is listed as coming in quantities of Diphenhydramine HCl 12.5 mg. Remember, the standard dose for dogs is one mg. per pound of body weight, 2-3 times daily. So, the answer to this question will depend on the size of the dog. 7. Will Benadryl make my dog sleepy? Drowsiness is one of the side effects of Diphenhydramine (the main ingredient, and hopefully only ingredient, in Benadryl), so it will probably make your dog sleepy. Of course, this isn’t 100% guaranteed to always bake your dog tired; he might not become sleepy at all! It also depends upon the age and size of your dog, and basic energy levels. If your dog is eating a complete meal along with the Benadryl, it will likely digest slower and may not make him tired. 8. What are the doses of Benadryl for dogs, or what doses does it normally come in? However, like any drug, pet parents need to be cautious. No matter the size of the dog or how much you think you know, you probably aren’t a doctor (let alone a veterinarian). Call your vet first; it’s free, and won’t take up very much of your time at all! Please Feel Free to Share Your Thoughts & Opinions in the Comment Section Below! Dog expert and professional trainer from Kansas. Ear Mites in Dogs – Signs and Symptoms. How to Get Rid of? Why can dogs take 1mg/lb several times a day when adult humans are not advised to take anything even close to that? I just don’t get it and can not find any info as to why this is…someone pls explain!! Plssss!